Just as good in person!!! Read the reviews were all positive.. my floors are gray brown walls are gray. Dimensions 126.0 In. X 96.0 In. X 0.5 In. I was uneasy ordering a rug from online because I prefer to see and touch firsthand what I'm interested in. I had high anxiety when the rug was delivered, because if it looked cheap, I would have the expense of returning it; something we all are faced with. I want to say that this rug knocked my socks off. The colors and pattern are true to the photograph as pictured. The rug appears to be closer to .75 inch pile but is advertised as less. The rug weighs a ton, and that alone will tell you that it's thick. The backing and the binding on the reverse are first rate. The workmanship shows. The rug does not shed as some people say they experience with the wool rugs. I love the colors and the pattern and this rug will be with me forever. The only thing I found that was a disappointment is the measurement. The 8'x10.5' rug that I ordered is actually about 2-3 inches shy on the length and the width. 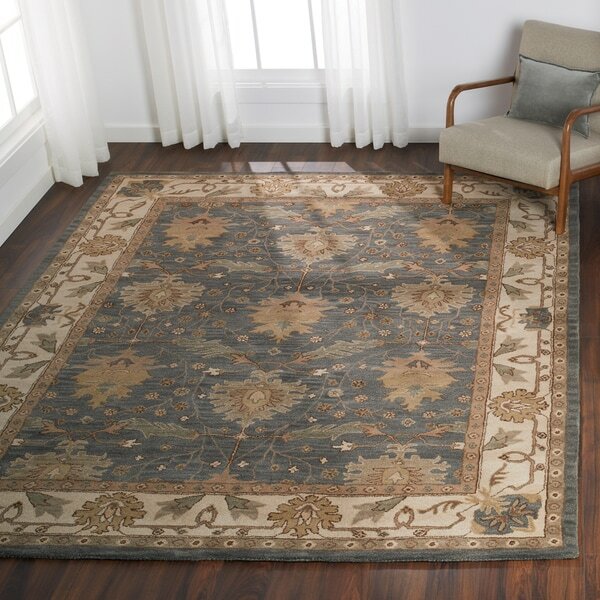 I recommend you buy this rug or others from Nourison India House. This is a Beautiful rug. Absolutely love the grey and cream color. Perfect for my living room. I would recommend this rug to anyone who has a grey and cream or grey and beige color scheme. It will not disappoint. Lest I forget to mention the softness of the rug that has been great to all our tired little feet. It is fabulous!!!!! This 100% wool rug is just beautiful in neutral gray, tan, and ivory. It has a thick nap, so it feels great underfoot. I would have expected to pay much more for such a high quality rug. This is an absolutely beautiful rug, although its not the one in the picture, not exactly. They colors are more beige and light blue gray. Its a fantastic quality piece that sheds like a long-haired cat in a room full of rocking chairs though, so you have to vacuum it A LOT initially, until all the loose fibers are taken up. I filled 3 vacuum bags cleaning three of these type of rugs in my home, amazing how much they shed. But the quality is undeniable, should be beautiful for many years to come. This rug is simply beautiful!! This is a beautiful rug. The colors are perfect and as decscribed. My client is thrilled with how it has anchored the room. It was a great layer to start with and build upon. Seems like it will hold up well to dirt. I was sent a defective rug that would not lay flat with huge round bubbles and completely stretched out with a very strong smell of mold and must have never had this happened with any wool rug I have ever purchased. "What if I order a rug and it doesn’t work in my room, how do I return it and what is the cost"
Matches my living room and dining room perfectly!